How can I encourage my son to play independently more often? To be clear: I believe children can play independently through their own direction without special “tasks” or “toys,” but I think a mama/caregiver who needs a few minutes can get her needs met with well-designed activity. When training to be a reading specialist, a professor told me that an activity is good for a child if they can feel both challenged and successful. In this instance, the caregiver also needs the child to be independent and safe. The following are a few things to consider when designing activities to meet these goals. 1. 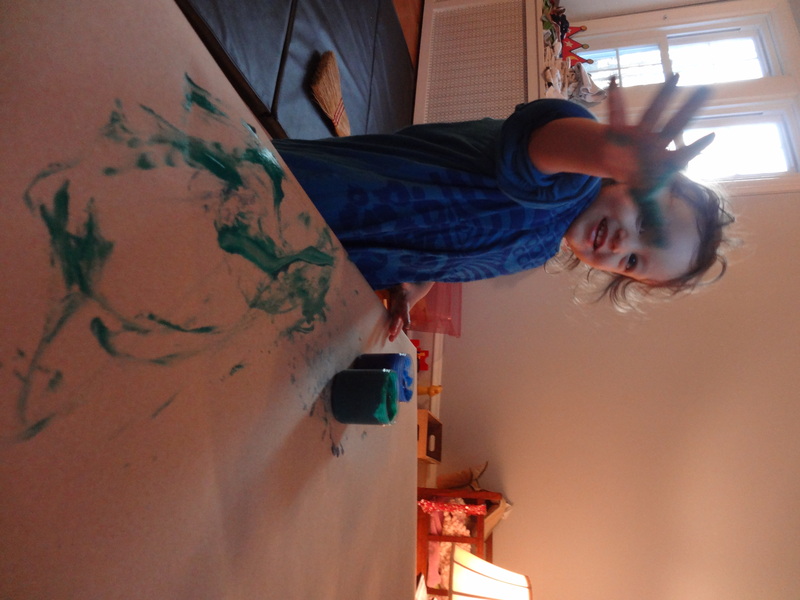 Choose an activity that is developmentally appropriate for and of some interest to the child. Developmental stages come with their own interests that can be used as a foundation. 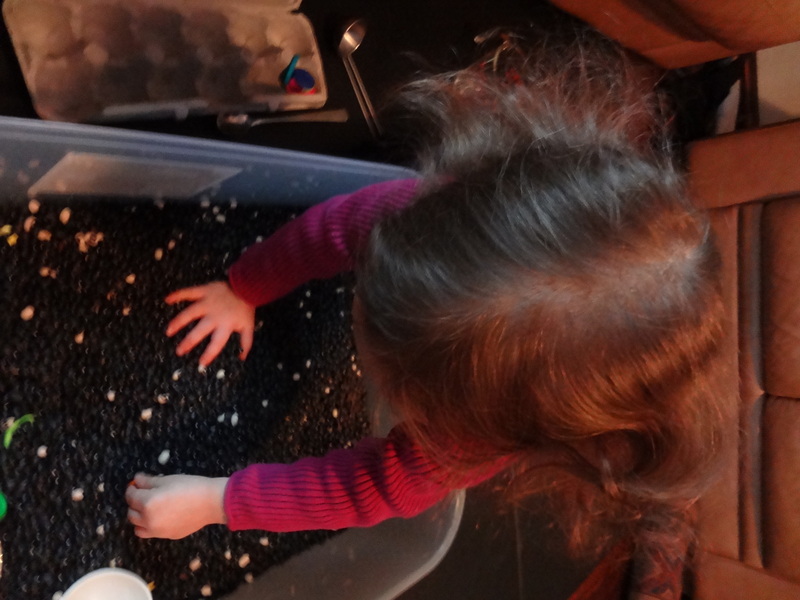 For instance, toddlers are working on understanding open and close as well as pouring and dumping. 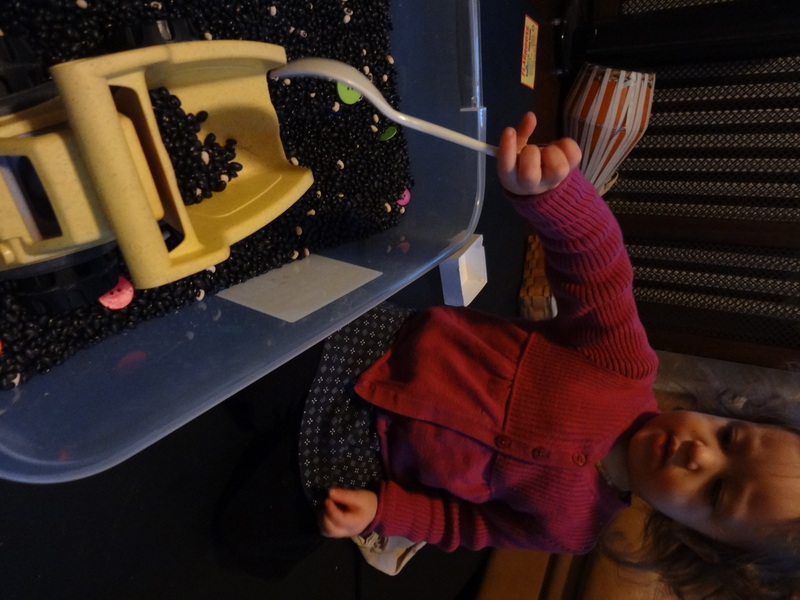 Stirring (mixing) and sorting, tearing and toppling are also stimulating to many toddlers. (Notice these are physical activities as opposed to reading a book.) These will be probably be favorite activities and have the potential to hold a child’s focus as they learn through play. Some children will also exhibit a strong interest in or knowledge of a particular topic. 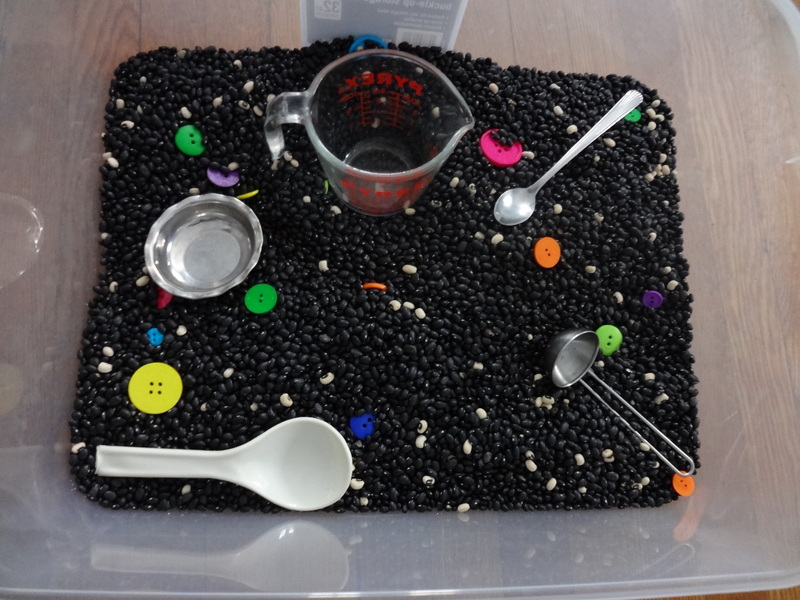 This background can be used to create a theme for an activity, such as a sensory bin, or could be helpful if they are trying something for the first time or need an extra boost. 2. Consider your own mental and emotional attitude when choosing materials. 3. Create an appropriate amount and type of space to do what is necessary along with a helpful amount of containment to keep the mess to a sane level. 4. Encourage confidence, creativity, and curiosity when you do play together with your child. Confidence, creativity and curiosity will help a child play independently even through moments of frustration. Going along with your child’s imaginary play and game ideas can build confidence. Generate play possibilities for later independent play while encouraging your child’s creativity with open-ended statements and questions such as “I wonder where the ducks are going,” or “What should we do with the stick?” Model curiosity and independent play by actually getting into your own games and adventures. I love what Janet Lansbury has to say about playing in a way that allows for a child to feel that “I did it” feeling. The more a child feels like they can do, the less they need you to do, including play. 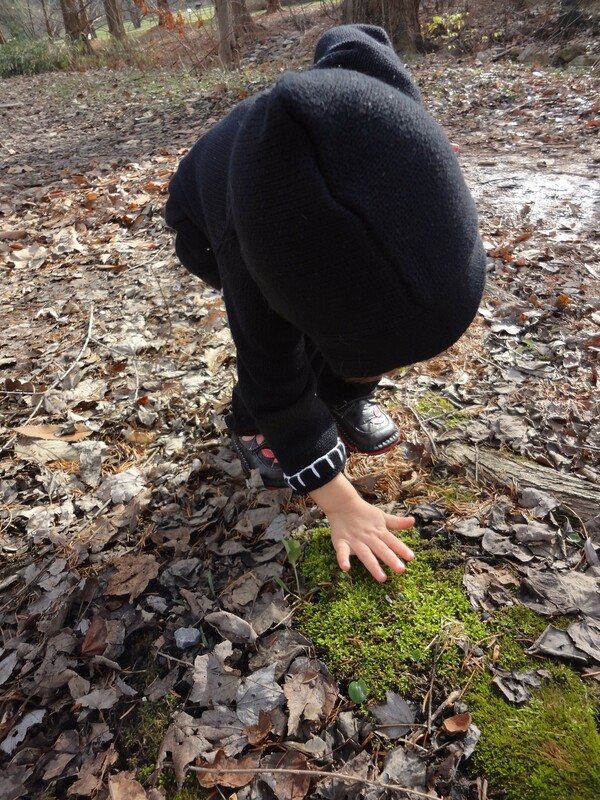 Balancing times where you are a fully engaged participant with times where you are a quieter observer will make the jump to independent play more natural. 5. Talk with your child about feelings, especially frustration. I wrote a post on feelings about my own experiences talking with my daughter, particularly around frustration. I believe that this talk and the breathing we often do together has led her to be able to take a moment to gather herself and try once again. Sometimes she will ask me for help out of clear frustration, and I might say “You seem frustrated. It is hard to pick up the bike by yourself. If you need to you can take a breath and try again or take a break.” This allows me to find out if she really needs my help physically or if it’s more emotional help that she is needing to keep playing. It also communicates to her that I am confident she can handle the task. The more she can try again independently, the more chances she has to explore, be creative and problem solve….all independently. Again, I’m working on these things, too, but I hope these tips help others. I have found that with these things in mind I can design an activity that my child loves and can play with independently. This has been particularly helpful these last few weeks because I can breastfeed baby or get a meal going with minimal supervision. Sometimes, though, I find myself just sitting and watching her play even when I have goals to do other things, just because watching a child play is fascinating, inspiring and beautiful…. especially when it’s you’re own child! Sound Shakers — not such a hit with my daughter…yet? 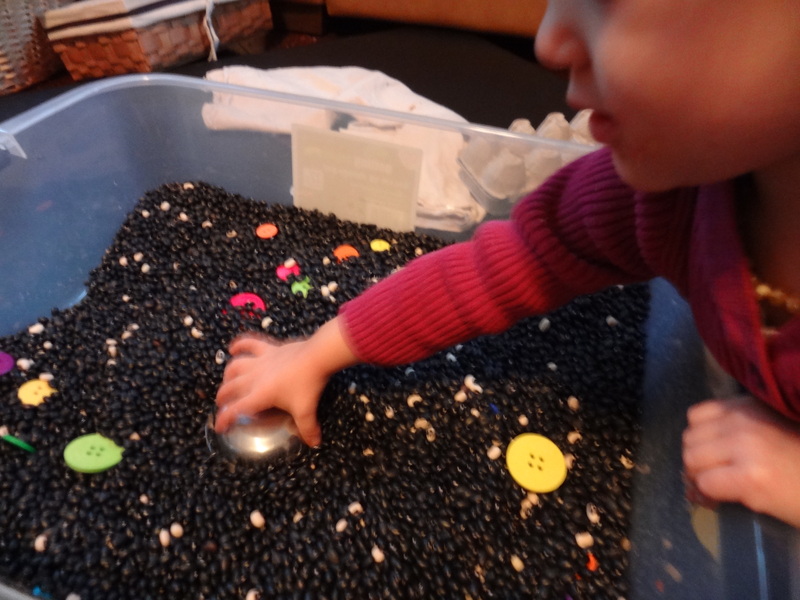 Sensory Bin: Beans and Buttons! It was rainy, slushy, dark and cold out. I knew was taking care of the kids alone for a chunk of the afternoon. I didn’t want to take the baby out in messy weather (my baby boy is one month old!). 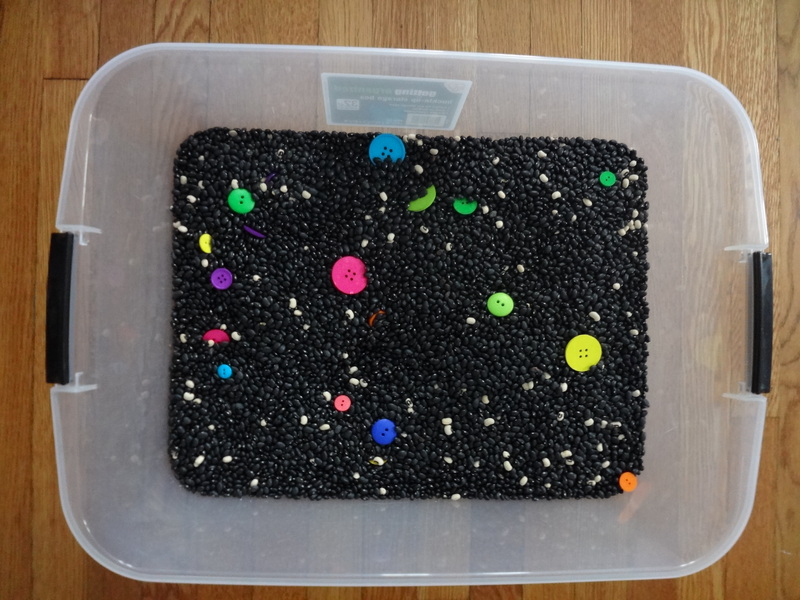 I decided throw together a sensory bin I had been thinking about for a bit. My daughter played with it for the entire two hours my husband was gone. Yet another confirmation that simple is best. I did play with her and share some of my own play ideas. It was easy and fun to practice sharing language and have quiet moments to just watch and play. 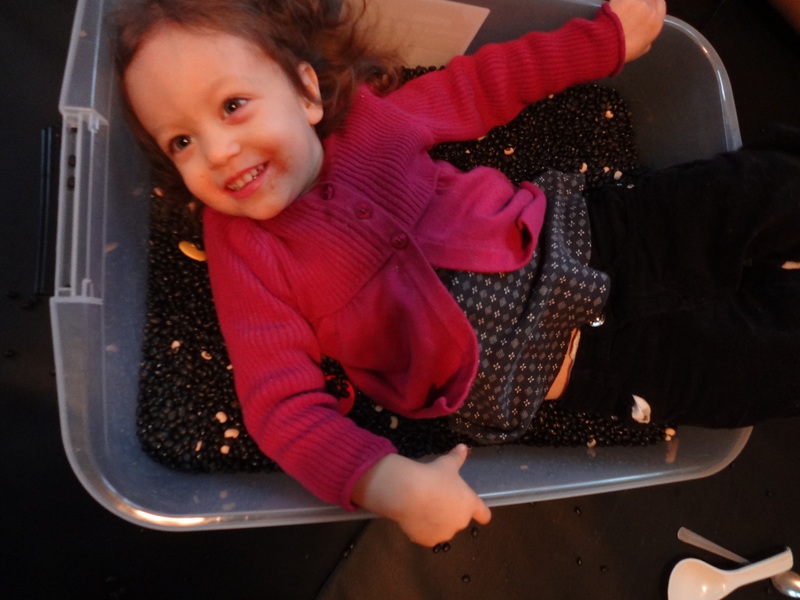 I put a bunch of black beans and a few handfuls of black-eyed peas in a bin. I added buttons of various colors and sizes. 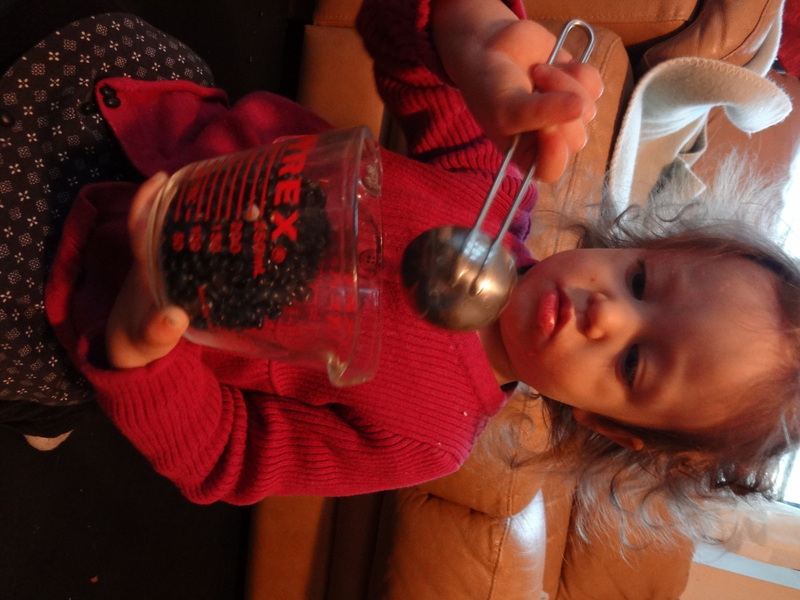 I threw in some spoons and containers for scooping and pouring, stirring and dumping (toddler favorites!). She discovered things and buried things. I have totally been having funky fussy feelings. I want to blog and hang on A Living Family Facebook page since I’m feeling momentum . However, I need to create another life for myself (financially), and part of that is becoming a childbirth educator. Instead of reading and researching and writing to finish my certification, which hopefully will get me some income in the future, I’m doing the same things for free. I love doing them, but I’ve only been given two years to finish my certification and over a year has passed. EEK! Step in Christine of The Aums and her Blog and Laundry Break post. Seriously, other than the fact that I have no idea what a meme is, this woman was speaking directly to me! I need to take a blog break. This is hard because I love writing and have so much I am thinking about, so much that seems worth sharing (I hope). I also feel eager to start building a new life around all these things that I am passionate about: childbirth, breastfeeding, home/unschooling, and all kinds of parenting topics from babywearing to baby-led solids, from signing with children to gentle discipline. Christine’s taking a week off, but here’s my plan. I like feeling community on Facebook with all the mamas out there, so I’m going to keep doing that but limit my computer time to an hour a day. On the blog, after I finish the book club post that is late, I’m going to run the posts I have scheduled. I will keep up the Unconditional Parenting posts every week and the Sunday Surf every other week. I’ll also share my Mamatography blog each week. Then I will take the month of February and see what I can get done when I get serious with this birth educator work. Reading Birth Reborn (Michel Odent), The Thinking Woman’s Guide to a Better Birth Birth (Henci Goer), Ina May’s Guide to Breastfeeding …. and finishing Unconditional Parenting ….but I don’t have to write a book report on that. Tour a hospital or birth center (need two, but I’m aiming for one) and interview a medical professional there. 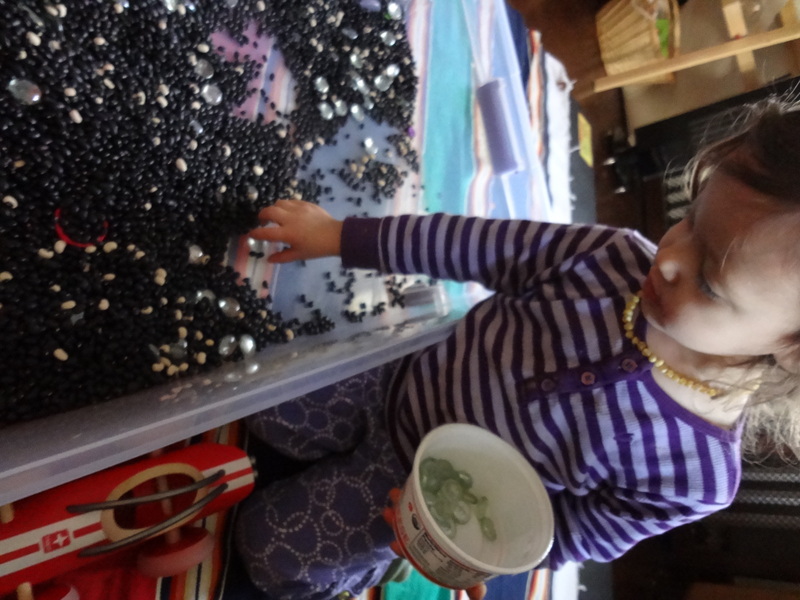 Spend time with and create activities for my two year old daughter. Stare at, smell, cuddle and kiss as well as marvel at my baby boy. Try to get some sort of routine/regularity/rhythm in our family life. Keep my house (and myself?) cleaner. Write my birth story for my second homebirth. I was at the lowest point in my mothering “career” so far. I knew my daughter needed me badly. I just did not feel I was coming from a place that was helpful. It felt hard to know what to do. for our online Book Club has made me consider). I looked more closely at my child, so small and so very big all at the same time. I watched her face, her gestures, her actions and reactions. I saw her curiosity, her desire for autonomy and competence. I started to see her need for closeness, her new feelings of vulnerability and fear. I saw my daughter through new eyes, and my heart swelled once again with love and compassion for my little blessing. As I filled my heart with trust and my head with patience, she has had more space and scope to be and to feel and to live.What I noticed is that my daughter is having feelings and feeling sad sometimes, and sometimes this leads to her nose touching obsession. I realized that she does need extra cuddling and closeness right now, sometimes wanting to be carried like a baby. How did I find all this out? I asked her. We have come such a long way in a short time, with my attitude adjustment and shift of perspective making all the difference. Still, things are not perfect or settled. I still apologize and have unhelpful thoughts and frustrations. Overall, I am finding myself in a more peaceful, loving, compassionate place. Whew! Am I ever glad. 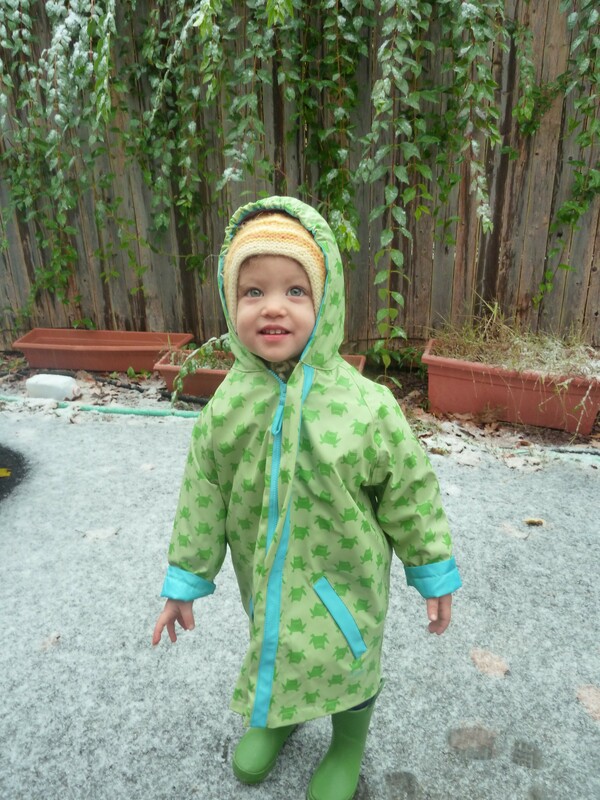 It feels so much better to be filled with gratitude for my amazing little girl. A much better way to mother…..
From the time a parent finds out there’s another baby on the way, one question that hangs in the air is: How will the sibling relationship be? The stories told of reactions to new siblings span the spectrum, from instant affectionate love to secret and overt hitting and hurting. (Please feel free to tell your stories in the comments!) When I was a baby, my own brother was kind to me when my parents were looking and hit me when he thought they weren’t. Or so I’m told. Having been surprised by my baby boy’s recent arrival, I didn’t get to finish all the activities and special big sister things I wanted to have in place for her before the birth. I had a sense, though, that even without those things my two-year old daughter was already in love with “her baby.” (The giveaway? The kisses and hugs and I love you’s my pregnant belly received.) Even so, I wasn’t sure how she would feel when baby actually came out and was demanding that this new family member’s needs be met as well as everyone else’s. Turns out she does indeed love her brother….sooooo much, as she says. She wakes up and wants to see him. She loves to give him kisses and hold his head and hand and “tosh the nose.” The problem we have run into isn’t in having her come around to care for him but in having her give him (and mama) some space. Believe it or not, my daughter’s displays of love and affection toward her sibling have sent me over the edge many a time. I realize things could be worse. However, our situation was complicated by the fact that we had to deal with jaundice which required me to stay in bed under bright full spectrum lights pretty much round the clock. Many of my parenting strategies that I would normally use if I was up and about I could not because I was stuck in a room that had more of her things instead of little other than books and her “new baby brudder.” This meant that pretty much constantly there were things that she couldn’t touch (pump parts, feeding syringe, homeopathy and more) near the bed in addition to her mama telling her she couldn’t be leaning over baby in baby’s face to give kisses when mama is trying to do something important (like nurse, syringe feed, change dirty clothing, and so on). In a fit of desperation I came up with the idea that when we really really want to touch baby we can give baby lovings from our heart instead (put hands on heart). She was into it, but still insisted on coming over, leaning in and touching her hands to his body. No matter how many times I talked about and modelled being gentle and used alternatives and empathy, this girl continually insisted on being up in baby’s face. I found myself losing my calm and getting angry and using my one free arm to hold/keep her back. This led to my two year old daughter telling her mama “don’t push me.” I was so frustrated and exhausted from dealing with baby’s jaundice (and possible tongue tie) that all I could do was have a dead end conversation with her about how I don’t want to push her and I don’t mean to get angry but I’m frustrated that she won’t stop touching baby. Wake up call: I was not handling this well. I was not considering my daughter’s perspective. I was not diving deeply enough into my resources to find a solution. I realized a few things after calming down and seeing things from her vantage point. She has been responding incredibly positively and lovingly to the pregnancy, birth and arrival of her brother. Instead of the potty regression that many talk about (and that may still occur), she has been more clear more often about having to go. (Part of this may be because we got a new travel potty seat that she decided she loves and enjoys putting on herself. We also got a potty step so she can climb up by herself and do the whole process except wash her bum.) This in baby’s face must stand up on the bed business is the one area in which she may be trying to show me the challenge of transition. I also realized that it must be completely unclear and seemingly arbitrary when she can touch baby and when she can’t. This last realization about her not being able to clearly tell when I can allow her to touch baby and when I need her not to led me to a possible solution. A few months ago my daughter recognized that when the stoplight turns green the car gets to go. This excites her and she often says when a light is green and exclaims “we get to go go go!” We also, then, have talked about what red means. We have to stop and wait. When I realized she didn’t know when she could come in close and when she couldn’t a lightbulb went off that maybe using red and green and her “go go go” excitement would make it much more clear to her what my needs (and baby’s) are at any given moment. So, I made two cards: one red card that says “Stop and Wait” inside a heart and one green card that says “Touch and Kiss.” I explained that green meant she could touch and kiss gently and that read meant she had to wait and if she was having trouble waiting the heart symbol meant she could give baby lovings from her heart. At first they didn’t seem to work too well because she ignored them and did what she always did. We kept trying the red/green wait/kiss cards, though. She did start responding by waiting and saying/asking if she could give baby lovings. I also found that I could stay more calm because I had a chance to give her permission to come over and could focus on giving her as much “green card” time as I could manage. This led to both of us getting our needs met more. It’s not a perfect solution (she was excited about the cards and wanted to hold and play them which doesn’t really work out well). However, whereas before my negative attitude was setting up power struggles that no one could or should win, I definitely feel that I shifted my own energy towards the positive which allowed her to do so as well. This simple card system has allowed us to get through a tough period of transition for all of us. I hope that I can keep bringing myself back to “finding solutions” as my husband said so that we can support a loving and respectful relationship between these new siblings……and keep our sanity and respect as well. My journey towards being a tandem nurser has presented some big bumps in the road. Since the birth of my son (December 22), my daughter has asked to nurse and I have offered milkies, but she clearly does not remember how to. She either uses her teeth or just sits there mouth open. Plus, she says “I don’t like it” about the taste, makes a face and tries to spit. So, I may not end up the tandem nursing mama I wanted to be. (I’m also not sure that I am even wanting to be anymore since I have had to pump for my son’s jaundice which irritates on top of his possible tongue tie which makes for difficult nursing all on top of my daughter’s bad/nonexistent latch). My new focus, as I step into being a mother of two, is to strive to be a tandem nurturer. I came to this idea after some rough days of 24 hour light therapy for my son’s jaundice. The circumstances this created complicated the transition for the whole family. I started to hear and see myself turn on my daughter and begin being negative, criticizing and unbelievably impatient almost all the time. I was trying to think of and meet her needs as they are greater at this time, but it wasn’t evoking the empathy to spark creative and effective communication and loving mothering. At a total loss and at my wit’s end, I desperately went to my bookmarked parenting posts and gathered my parenting books to gather inspiration and ideas. [See resource list below.] I hadn’t read Respectful Parents, Respectful Kids yet but knew many the ideas from Nonviolent Communication: A Language for Relationships and The Compassionate Classroom. What I read suggested that my negative reaction stems from a fear that my needs won’t be met. This prompted me to ask myself: What are my needs? That stopped me dead in my tracks. That was the first thing I thought? And I had to actually think hard to figure out another need? I had just read the part in Unconditional Parenting about control for the book club. I knew that I didn’t want to be a critical, controlling mother. 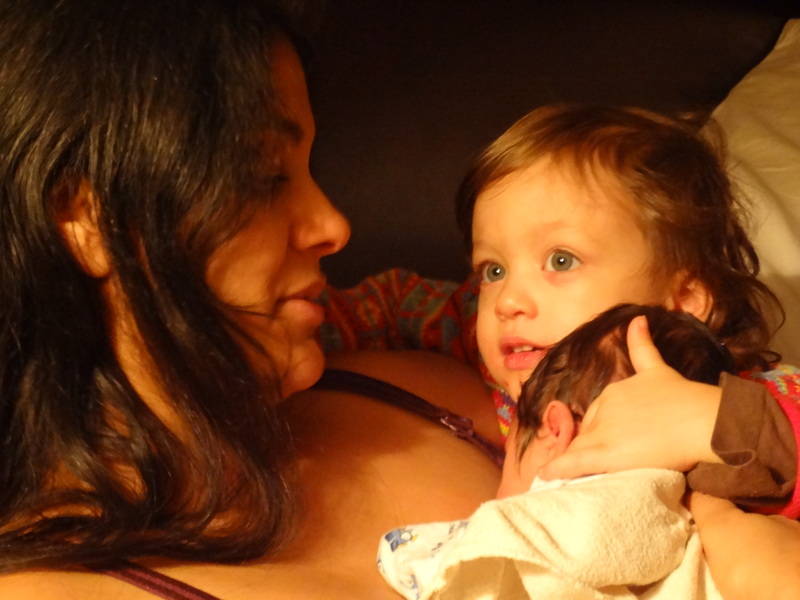 Here I was in my darkest, least loving moments of motherhood so far. I didn’t want to go to a place of blame and shame, not on my child for sure but not on myself either. I thought harder about my needs. I knew that my husband’s need is probably to have everyone safe and secure. A significantly jaundiced newborn baby who requires light therapy and a vibrant two year old bouncing around the bed, leaning on the baby and blocking the light were easy triggers for his fear of someone getting hurt. I tried on the idea that my need was for their safety, and it wasn’t clicking. I searched elsewhere. My mind settled on the simple, joyous moment I had with my baby earlier. It was just the two of us. I knew my daughter was being cared for by others and would not disturb our space or disrupt my moment with him. This brought me back to a post I had just reread (in my desperation) on Encouraging Children with New Siblings through the transition. I realized I need to have time where I just focus on my baby. I also need to have time where I can focus on just my daughter. I know … they aren’t profound ideas, but I felt the truth and breadth of those needs. 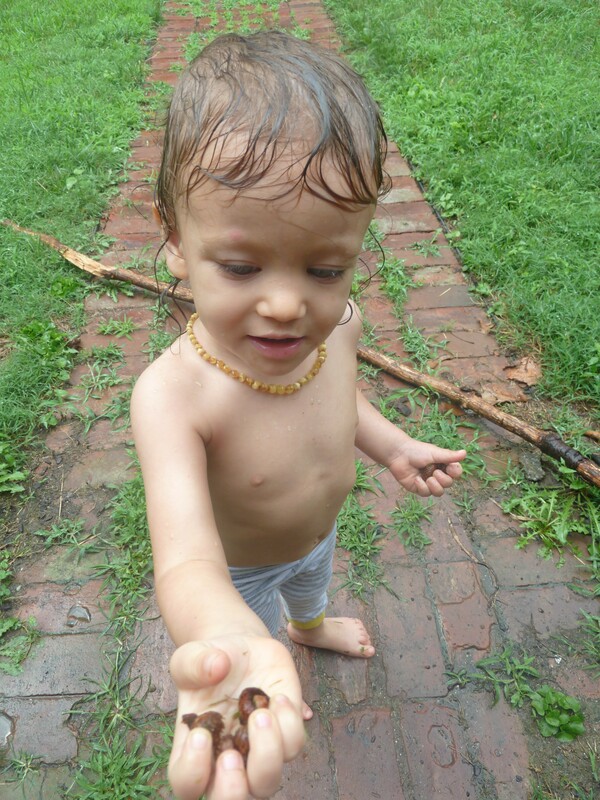 I realized that when I feel like my daughter is “invading” my son’s space, it is not a fear for his safety but a desire to connect deeply with my son in this most precious early period and while he is working through the jaundice. Likewise, when I want to focus on and engage with her (beyond reading a book or taking her to the potty or talking from afar while she shows me something) I find myself distracted because he usually with me or right there with both of us. Above all……this too shall pass…..
My son’s jaundice will not last forever. My questions about his tongue tie, my milk supply, and our cosleeping situation will not last forever. My body’s need to recover will not last forever. My containment to a single space will not last forever. This period of transition will not last forever. My negative response to my daughter’s needs, my needs and the needs of my son and husband will not last forever. I can turn this around. UPDATE: After realizing and acknowledging my needs, I immediately felt more compassionate, caring and patient toward my daughter. I told my husband my needs, and we talked about his needs as well as the importance of our trust in our daughter (which seemed to have suddenly diminished). I love having special time alone with each of my children. It’s only been a short time, but I definitely am taking the reminder to keep my relationship with my daughter as a priority above obedience and compliance. As I take the control out of my tone and words, the power struggles are fewer and our interactions more positive and loving. I certainly have had many more joyous and connected moments with her, and that builds my confidence that I *can* be a tandem nurturer of these two blessings of mine….